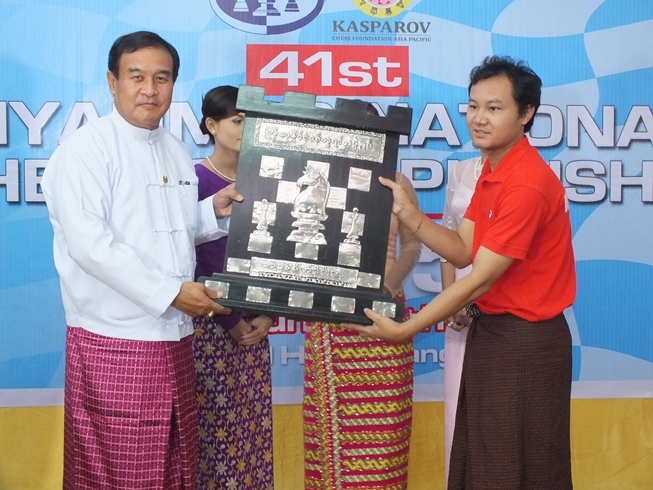 Maung Maung Lwin, President of Myanmar Chess Federation officially opened the tournament on 25 June 2015 while H.E. U Thaung Htike, Deputy Minister of Sports was the guest of honour at the Awards Ceremony held on 5 July 2015. There were 16 players competing in this event; 4 seated national players and 12 qualifiers. IM Wynn Zaw Htun led all the way, but his intention of making a record by winning with a 100% score was spoiled in the 12th round when he lost to Nyi Nyi Lwin. Still he was the clear winner with 14/15. He also won last year with a record score 14.5/15. He managed to increase his tally of national titles to six – yes, he has now won the national champion title six times including the last three. In the opinion of Myanmar Chess Federation officials, Maung Maung Kyaw Zaw Hein, the youngest national qualifier in the Myanmar chess history should have done better. Standing at 10th position with 6.5 points was not bad for the first-time participant, but very low relative to his talent and level of play. It is hoped that he will take this experience to make a big improvement and perhaps even win a future national championship as the youngest national champion!